If you are looking for a suit of armor like they wore in the Middle Ages, then you are looking in the right place, so long as you are here, looking at Dark Knight Armoury. Here, we have everything you need to outfit yourself from head to toe in gleaming steel armor that will give you the total protection that the knights of old enjoyed when they rode into battle. Browsing through our metal armor section will show you that we do, indeed, carry quite a few pieces of armor, both as individual pieces, partial sets, and full suits of armour. This variety allows you to pick your level of protection and build on it, if you desire. This means that if you are looking for partial protection, you can browse through our selection of metal arm armor and metal leg armor to find just the pieces you want to keep your limbs safe. Add in a piece or two of metal body armor and you will be almost set for battle. Did you pick out a pair of metal steel pauldrons to wear? Well, you will need a metal steel gorget to go with it, as this will not only keep your neck safe, but it will also keep the pauldrons secured on your shoulders. You can also cut out the hassle of building your own suit and just pick up either a metal steel armor package or a full suit of armor. Our steel armor packages offer various levels of protection, ranging from minimal coverage to maximum protection, and our metal full suits of armor take that a step further, by layering you in steel that will keep you protected from virtually anything you encounter. 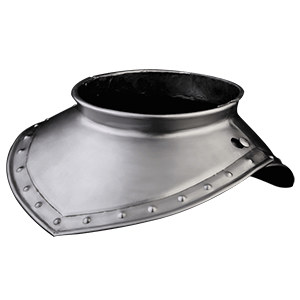 Our metal steel armor is great for medieval reenactments, stage events, and theater productions, as it lends a touch of authenticity and realism to your look. And of course, it also goes without saying that it is perfect for SCA events and LARP battles, where you will really appreciate the level of protection that a good suit of steel can provide. Are you heading into battle any time soon? Do you want to be perfectly protected behind a suit of steel? Then you are right where you need to be, right here in the metal armor section at Dark Knight Armoury. 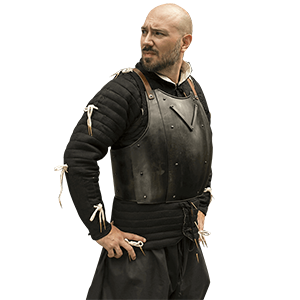 One of the most iconic things for a warrior to wear in the Middle Ages was the suit of armor, and at Dark Knight Armoury, we are proud to offer pieces of metal body armor for the modern-day warrior to wear! Our metal plate armor is hardy and rugged, possessing a great look as well as a strength that will keep you safe from sword-blows and spear-thrusts. Contrary to typical belief, plate armor was not the invention of the Middle Ages, but rather, had early predecessors in the years of Roman rule, when armor like their lorica segmentas were popular. These pieces of plate armor fell into disuse for a time, although eventually, during the Late Middle Ages, plate armor again became more common. It was particularly favored by knights and mounted cavalry, although infantry and ground units wore it as well. Plate armor was also very common among the nobility, who enjoyed rich, decorative suits of armor that showed off as much status as they did protect their wearer. The more common pieces of plate armour were the breastplate or the chest plate, which offered protection to the front of the chest. 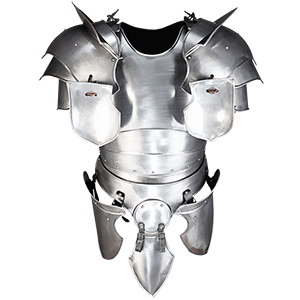 Paired with a good back plate, which would cover your back, this style of armor kept your torso virtually safe from direct harm. At Dark Knight Armoury, we offer many different styles of breastplates and back plates, allowing you to craft your own armored look to suit your needs, while we also offer cuirasses and harnesses, which include both pieces, to provide the total protection that you desire. And the best part is that our metal body armor is great for a variety of uses, ensuring that you can use it for SCA, though we recommend checking your local rules and regulations, for LARP, for fairs, for costuming, or for whatever else you have in mind! Given how important your arms are in a fight, it makes sense to keep them fully protected. The metal arm armor found here at Dark Knight Armoury works wonders for keeping your arm protected, ensuring that no matter what weapon comes hurtling your way, your arms will be safe and secure behind several different pieces of plate armor. Arm armor comes in several different styles, and it falls to each individual warrior to determine what arm armor is best suited for them. Bracers typically offer the least amount of protection and are light, making them easier to wear. Next up are gauntlets, which cover part of the forearm, the wrist, and the hand, including the fingers. 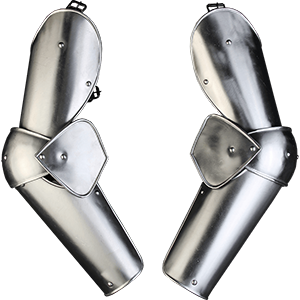 Pairing a gauntlet with a set of functional full arm armor provides some of the greatest protection, securing almost the whole arm behind layers of protective steel. And of course, pauldrons keep your shoulders safe and can be worn with virtually any of the above pieces. All of our metal plate armor at Dark Knight Armoury is crafted from steel and is of the highest quality, being crafted from either 16 or 18 gauge durable steel that is suited for use in both LARP battles and in SCA events. Of course, you can also choose to wear it because it looks cool, making it great gear to wear when you are concerned with your appearance for something like a theater production or a stage appearance. Want to keep your arms safe? Then take a gander through our metal arm armor section and see what catches your fancy. Are you looking for some leg armor to wear when you head onto the field of battle? Well, look no further than at Dark Knight Armoury, because we offer a wide selection of metal leg armor that will keep your legs as defended as you desire! 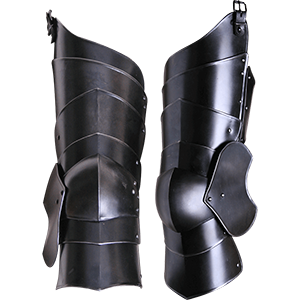 Not only will it keep you protected, but our various styles of leg armor will also make you look that much more like a true medieval warrior. Historically, leg armor came in various shapes and forms, and we endeavor to provide historical accuracy here, so we offer various styles as well. Greaves and tassets are among the most basic forms, as greaves are worn on the lower leg and provide a modicum of protection, although they are also quite light in weight, which means you will not tire yourself out wearing them. Tassets, on the other hand, are worn about the waist like a belt and help to protect your upper legs and thighs. Full leg armor is a bit weightier but also a lot more protective, as it encloses the leg almost completely, making it much harder to strike decisively. Much of our metal leg armor is crafted from either 18 gauge steel or 16 gauge steel, which makes it perfect for use in SCA, reenactments, and LARP battles, as well as for use as casual costume pieces that really make you look like the most powerful warrior around. And because of its great, yet simple look, much of our leg armor will fit into virtually any theme imaginable, so you are free to wear it when and how you want! If you are looking to defend your legs and lower body with some knightly armor, then why not take a brief visit to the metal leg armor section at Dark Knight Armoury? You are bound to find something that will do just the trick. A gorget is more than just a typical piece of armor that protects your neck. In fact, they are that, and so much more. Any one of the steel gorgets you will find here at Dark Knight Armoury will not only protect your neck, collar bone, and shoulders, but they are also made for helping you wear other pieces of armor, as well! Most of our gorgets are crafted from 16 gauge steel or 18 gauge steel, which makes them perfect for use in combat and reenactments of all sorts, ranging from harmless LARP battles to SCA reenactments. Contact your local chapter first, as regulations can vary from place to place. Many of our gorgets also feature additional leather buckles and straps that will attach the gorget to a pair of pauldrons, which only adds to your ability to wear a suit of metal armor. We also offer bevors, which are like gorgets that extend up over the neck and lower face, and other wearable neck guards in various metals, which are perfect for adding that extra bit of safety to your person when you head into battle. We also offer gorgets in smaller and larger sizes, ensuring that large warriors and children alike can all join in the fun of a good medieval reenactment! If you are planning on wearing pauldrons with your armor, you might want to invest in a gorget, although even if you are not, a steel gorget from Dark Knight Armoury is still a great addition to have, as it completes your armoured look nicely and will also provide that added bit of protection right around a particularly vulnerable area. Dark Knight Armoury offers, by far, the easiest way to put together a complete and cohesive looking suit of armor, thanks to our numerous metal armor packages. Each one is chock-full of great pieces that are all battle-ready, ensuring that no matter which one you get, from our smallest to our biggest, you will be equipped with the protection you seek for your battles ahead. Each one of our complete armor packages offers everything you need to create a fully armored look that will no doubt intimidate your enemies and inspire your allies, all while making you feel like an authentic warrior straight out of either the medieval era or the realm of fantasy. Our full sets typically include a breastplate, a back plate, pauldrons, bracers, greaves, and a tasset belt. Specifications can vary, so you should consult the item specific item descriptions to verify what sets include and what sets do not include. Some of our other armor sets are slightly less extensive, although they are in no way less impressive, as they serve to create a lighter, yet still armored look that will perfectly accent any warrior appearance with ease. Almost all of the armor in our metal armor packages are crafted from high quality 18 gauge steel, which makes them great for use in a variety of situations, including use in LARP battles and as costume pieces. You can use them in reenactments and SCA events, although you should check with your local chapter first as rules and regulations can vary from locale to locale. Like the warriors of old did, we recommend any of our gambesons be worn underneath the armor, both for reasons of comfort and ease of movement without any pinching, as well as to add some padding for absorbing impacts. So if you want a complete armored look without all the hassle of having to assemble the armour yourself, then look no further, because the metal armor packages at Dark Knight Armoury have basically everything you will need to keep yourself protected when you head off into battle. For a level of protection that cannot be beaten, you will want to invest in one of Dark Knight Armourys metal full suits of armor. 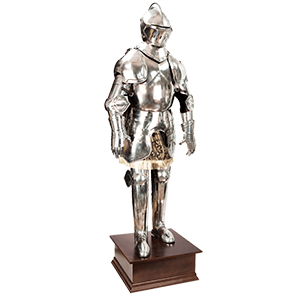 These suits of armor are modeled after the typical examples of plate armor that would have been common during the Late Middle Ages, and will give you both the protection and the look of a real knight in shining armor. These suits of steel armor and some of the finest in quality, providing an authentic look that will leave others speechless, as well as a high degree of protection that many opposing warriors will have trouble getting through. For a period of about 3 to 4 hundred years, plate armor reigned supreme as the dominant armor of the battlefield, being preferred by both cavalry and infantry. It was only the invention of flintlock that forced plate armor into a decline. Our suits of plate armor echo the look and feel of classic examples, ranging from the typical styles that were common all across Europe, including English plate armor, Gothic plate armor, and Milanese plate armor, as well as suits of armor that are modeled after the armor favored by certain kings, princes, and other noble dignitaries of those eras. As decorative as some of the suits of armor look, though, they are all fully functional and will provide you with all the defense you could want, whether you are participating in an SCA reenactment or a traditional LARP battle! You can also even wear them as costume pieces, just to give yourself the look of a true knight from the middle ages. And the best part is that we have a full suit of armor for every budget, ensuring that young squires can afford to get a set of armor that will keep them alive in battle, while fully-fledged knights and nobles can have the armor that befits their personal status and rank. So if you are looking for a metal full suit of armor to wear, then you will be happy to know that we offer just what you are looking for here at Dark Knight Armoury.